lti-billion-dollar fine on the Turkish-state-owned Halkbank over violations of US-imposed sanctions on Iran. But Turkey’s underlying economic problems run much deeper than that. As Becker presciently points out, it was to consolidate power before they took real toll on the population that AKP brought elections forward by a year and a half. With the mainstream press silenced and opposition in disarray over the electoral loss, the pro-regime media apparatus is blaming the growing immiseration on foreign conspiracies. mobilised voters, but faced very difficult conditions. The OSCE report pointed out that the right of assembly and press freedom are curtailed by the state of emergency. It underlined that the state president and the ruling party enjoyed significant advantages. They had ample resources at their disposal and enjoyed almost a media monopoly. For president Recep Tayyip Erdoğan much was at stake. The elections mark the transition to an ultra-presidential regime which was narrowly approved by a referendum in 2017. To a significant degree, the president will be able to rule by decree. Thus, special features of the state of emergency will turn into “normal” powers of the president under the amended constitutional arrangement. 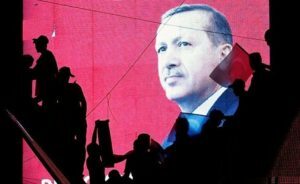 In spite of a surprisingly weak election campaign, President Recep Tayyip Erdoğan was re-elected with 52.6% of the votes. He tried to project himself as the leader of a rising international power. 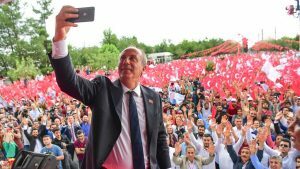 After a spirited campaign, the candidate of Cumhuriyet Halk Partisi (CHP), Muharrem İnce, came second with 30.6%. He assembled more votes than his party in the parallel parliamentary elections. Coming from a modest social background, İnce presented himself as a “man of the people”. When Erdoğan called him a poor wretch, he replied that he is coming from a poor family, but that this is better than to live on dubious wealth. This is an allusion to the legendary wealth that is attributed to Erdoğan’s family. Selhattin Demiraş of the left-orientated and pro-Kurdish Halkların Demokratik Partisi (HDP) was campaigning with a huge handicap. He is imprisoned for political reasons and had to campaign from a prison cell. In spite of the extremely adverse campaigning conditions, Demirtaş got 8.4% of the votes. He had made his campaigning conditions a topic of his election campaign. Both İnce and Demirtaş highlighted the dangers of an excessive concentration of powers in the hands of one person. İnce paid a visit to Demirtaş in his prison cell. This was a practical declaration of solidarity and a cautious opining of the CHP candidate with his rather Turkish-nationalist background towards the Kurdish voters. The right-wing, strongly Turkish-nationalist, but oppositional candidate Meral Akşener of İyi Parti received 7.3% of the votes. The parliamentary elections showed a similar pattern. The alliance of AKP and the extreme right-wing Milliyetçi Hareket Partisi (MHP) received 53.6% of the votes. The result confirms that AKP on its own is not able achieve an outright absolute majority in the parliament. It received 42.5% of the votes. This confirms that the electoral base of AKP is gradually eroding. The party lost not only votes in the big metropoles like Istanbul, but also in very conservative Anatolian cities like Kayseri. Some disgruntled AKP voters did not want to vote for AKP anymore, but did not want to vote against the party either. They cast their votes for MHP. The party received 11.1% of the votes. That is only slightly less than in the last elections. Due to the weakened electoral appeal, AKP now is strategically tied to its ultra-nationalist ally. MHP did not demand ministers in the new cabinet, but certainly it wants parts of its nationalist agenda realised. Directly after the elections, MHP leader Devlet Bahçeli called for even tougher repression against intellectuals and journalists. At the same time, he advocated amnesty for several convicted Mafiosi because they are patriots. 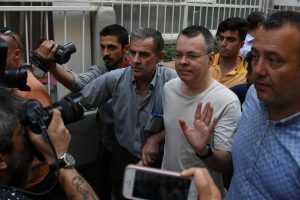 The links of the far right and organised crime are nothing new in Turkey. Turkish nationalism is the basis of the AKP-MHP alliance. The AKP election campaign had been based a strongly nationalist agenda. It presented Turkey as a rising power. Domestically, its nationalist strategy is directed against the Kurds though AKP had shown a certain flexibility in the so-called Kurdish question in the past. Until 2015, the AKP government had even been engaged in talks about a political solution. When these talks did not pay off electorally, AKP lost the interest in them and played finally the Turkish-nationalist card. It seems that these identity politics proved to be successful. Economically, the ruling party could offer less than in the past. Credit-based growth is losing steam. The Turkish lira has lost almost 20% of its value since the beginning of the year. Inflation is rapidly rising and the official unemployment rate is about 10%. Many more people are underemployed. The opposition alliance of CHP, İyi Parti and smaller parties received 34% of the votes. With 22.7%, CHP was the strongest force in the opposition alliance. Compared with the past, however, this is not a good result for CHP. The centrist party has an unclear profile relying mainly on a laicist and democratic message. İyi Parti which had been recently formed by MHP cadres that resented the MHP alliance with Erdoğan got 10% of the votes. It seems to have attracted at least those MHP voters that are rather laicist nationalists and are disgruntled with turn of MHP towards the religious AKP. For HDP as a pro-Kurdish party, there was no place in the opposition alliance. In the election campaign, HDP highlighted issues of democracy and peace on the one hand and social issues on the other hand. 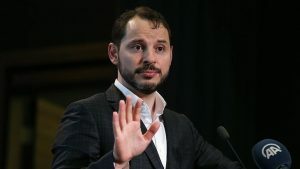 It proposed a significantly higher minimum wage, an end to the outsourcing of labour, an unlimited unemployment insurance of 1000 lira and relief for indebted households. HDP slightly increased its votes to 11.2%. It gained additional votes in the big cities, but lost some votes in its strongholds in Southeast Turkey where the repression is particularly intense. HDP was campaigning under particularly dire circumstances. Its charismatic presidential candidate and 10 of its members of parliament were in prison. In Southeast Turkey with its Kurdish majority, its mayors had been deposed during the state of emergency. 4000 of its activists have been arrested, as Kati Piri, the rapporteur of the European Parliament on Turkey, points out. Intellectuals that plead for a political and peaceful solution to the so-called Kurdish question face harsh prosecution. Given these circumstance, the Turkish opposition forces achieved a remarkable result. The election confirmed that the country is divided roughly half-half into pro-government and opposition forces. AKP is particularly strong in inner Anatolia and at the Black Sea. The strongholds of CHP is in the west, whereas HDP dominates in the Kurdish areas in the Southeast. AKP’s ascent to power started after the severe financial crisis of 2001. At that time, it profited from the almost complete de-legitimisation of the existing parties. AKP emerged out of the Islamist political current, but initially reached out to liberals and big business as well. Conservative businessmen and a conservative-religious intelligentsia formed its core. Through Islamic charity and social policy, AKP tried to tie informal and precarious workers living at the periphery of the big cities to the party. From the very beginning, AKP tried to nourish a business class close to the party. It could rely on existing business associations of religious-conservative businessmen, like MÜSIAD, for this. Many of those businessmen originated from Anatolia, but MÜSIAD has many members in Istanbul as well. It would be simplifying to say that AKP is relying on an Anatolian bourgeoisie. Rather than a common geographical background, the conservative businessmen share a paternalist approach to labour relations and a reliance on cheap labour. Conservative business is partly active in export industries, and partly in construction. Big pro-AKP firm – like Çalık, Kolin, Limak, Kazancı and Cengiz – gained from big privatisations, e.g. in the energy sector. Tenders have been systematically awarded to AKP firms. Construction – both infrastructure and housing – has been a key sector for building pro-AKP business through tenders. In taxation issues, the authorities have been lenient to pro-AKP business, but meted out harsh fines to firms that had been in conflict with the AKP government. Bankruptcy rulings have been instrumentalised for bringing business toeing the party line. After the failed 2016 coup, businesses close to the Gülen movement were seized. The Gülen movement, a religious network comparable to the Opus dei, was regarded as being behind the failed coup. The Gülen community had closely cooperated with Erdoğan his first government years, but later entered into conflict with him. Some years ago, the ruling party amended the Code of Criminal Procedure to allow the appointment of trustees in allegedly crime-related firms. The confiscated property provided a new source of businesses that could be transferred to loyal party supporters. Faced with the possible seizure of the property, some businessmen close to the Gülen Community declared their loyalty to the government. In its election campaign, AKP could rely on the funding and the media of the dense network of pro-AKP businessmen. The relationship of the party with older, large business organised in TÜSIAD has become tenser over the last years. The conservative-religious re-orientation of schools, universities etc. has opened new chances to the religious conservative intelligentsia. AKP has been able to build a mass-base through clientelist networks, charities and targeted social policy measures. Municipalities have been crucial in awarding contracts to small and micro-enterprises. This has been an important feature of building clientelist networks. Religious charities have closed some of the lacunae of the social security system. The Turkish welfare state had traditionally not included significant parts of the population, especially informal workers. The AKP government increased its scope. In particular, it enabled hitherto excluded sectors the access to at least a minimum public health service through the “green card”. Easy access to consumer credits enabled broader population groups access to consumer goods. This has increased the popularity of the government as well. Thus, the AKP power bloc relies on a material base, not just on identity politics. And AKP is embedded in a vast associational network. There have been losers of the AKP years as well. The democratic, laicist intelligentsia has been increasingly marginalised and has during the last years even politically prosecuted. There have been significant purges in universities and schools. At the workplaces, workers face difficult conditions. As the trade union federation DİSK pointed out in an election leaflet that was banned by a District Electoral Board, 21.000 workers lost their life in work accidents during the AKP years. Wages did not keep pace with growth. Trade unions face massive restrictions. The Kurdish areas in the Southeast have suffered from intense government repression. lost 4% of its value on the day of the announcement. There is a major conflict between big business and foreign capital, on the one hand, and small and medium business, on the other hand, regarding the interest rates. The former advocate a rise in the interest rates in order to attract foreign monetary capital whereas the latter is dependent on domestic loans and advocates low interest rates. President Erdoğan has publicly defended low interest rates. The policy differences between Erdoğan and big business became visible on the nomination of the cabinet. TÜSIAD, the association of the big capital groups, underlined the crucial importance that it attributes to central bank independence and the rule of law (literally hukuk devlet, i.e. law-based state). The economic situation is already turning into the main headache for the old/new government. The credit-based growth model of the AKP government has already entered into trouble during the last months. Some big firms face financial problems. Indebtedness of households has reached critical levels. It has become more difficult for Turkey to attract foreign capital. The country relies on foreign credits for financing the big deficit in the current account. And the trend towards higher interest rates in the US will make external borrowing more costly for Turkey. More economic difficulties can be expected. Given its past record, it is more than probable that the AKP government will continue to blame external and internal “enemies” for its problems. 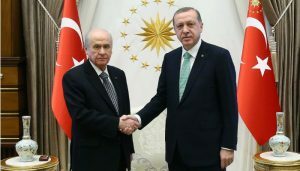 The alliance of AKP with MHP makes it highly likely that the Turkish-nationalist political line will even be stiffened. Turkey has already directly intervened militarily in some areas controlled by a left-Kurd alliance in neighbouring Syria, and the country might get even more deeply involved into the Syrian wars. It is one of the priorities of the new Turkish government to expand the arms industry. The relationship with NATO countries have displayed tensions during the last years. Recently, the Turkish government has sought rapprochement with Russia, but the two countries have different visions on Syria. While the Russian government has strived to stabilise the Baath regime and restore the territorial unity of Syria, the AKP government has consistently supported right-wing Islamist forces in the Syrian war. With the severe military setbacks of the Syrian religious right-wing, however, the main priority of the AKP government has shifted to prevent further institutionalisation of Kurdish autonomy in Syria. Domestic and regional policies of the AKP government are intimately linked. The involvement in the Syrian war has fed repression in Turkey, and the Turkish nationalist preoccupations with the so-called Kurdish question have massively influenced the regional strategy.